Project Geronimo, our vintage Chevy pickup project, was struggling with its antique stock breaker points style distributor system. The engine, a 261ci straight-six high-pressure Thriftmaster, has the reputation for being a very dependable workhorse – and we would agree when rated against other engines of the time. This vacuum-advance unit is part of the calibrated system that helps the DUI HEI distributor manage combustion. When compared to modern engines with technological advanced ignition systems, the old stovebolt engine would serve a better purpose as a boat anchor than a combustion engine. We certainly didn’t want to fall prey to the typical “let’s buy a race part” mentality because everyone knows that race car parts are better, right? That’s not true and it’s especially problematic when it comes to distributors. Race distributors that are for sale online at e-commerce speed shops are designed for engines that don’t have a need for vacuum advance, and are running wide open and rich all the time. A rich mixture is easier to burn, but is not very efficient. Expensive race car parts that are not efficient and probably won’t make many daily-driver project car owners very happy. 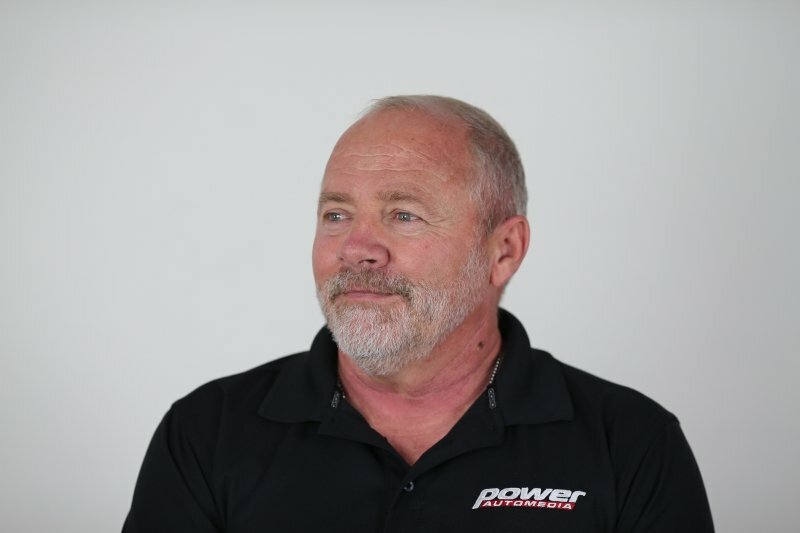 We talked to the experts at Performance Distributors to see if anything could be done to modernize the antique combustion system on our project truck. Surprisingly, the Memphis-based company offers a few different options that would bring our 56-year-old dinosaur engine into the New Millennium, From the Age of Aquarius to New Age, just with the swapping of a couple of components. The Performance Distributors' DUI HEI Street/Strip distributor is all custom hand-built and calibrated for each application. Requiring only a power wire to hook up the system, the HEI distributor housing is a perfect match for the stock distributor. The bottom of the distributor is marked with the advance curve and a the individual unit serial number. What Is The Problem With Breaker Points Distributors And Why Change? The simplest way to explain how breaker points work is to say that when the contact points are touching, they complete an electrical circuit. When they are open, the circuit is broken. In a contact breaker points ignition system, when the circuit is open, the magnetic field at the ignition coil collapses and a burst of high voltage electric energy is transmitted to the spark plug, where it creates a spark. That spark combusts the fuel/air mixture in the cylinder, which, in turn creates mechanical power as the piston is forced down. The stock ignition system requires an external coil, ballast resistor, and completely different internal workings inside the distributor. The contact breaker points ignition worked well 50 years ago, but fuels and ignition requirements have changed. This led us to an HEI upgrade to make our daily driver project truck more dependable. The points have to open up enough to break the circuit and prevent any arcing, and they have to close long enough to regenerate the magnetic field before the next spark is fired. Anyone that has worked with breaker points will remember setting the gap that the breaker points must open, and setting the dwell, which is the amount of time that the points were closed. Honestly, this was a pretty simple system that worked well for the time, although there were some inherent problems with the points that required routine maintenance and replacement. The biggest concern was based on the transfer of material from one side of the breaker points to the other as the points would open. The act of arcing would transfer a very small amount of metal across the points. As this metal built up over time, the gap between the breaker points would close slightly, which promoted more arcing. As the gap started to close up, the engine would misfire under hard acceleration. Eventually the gap would get tight enough that the misfire would occur during normal operation. The DUI HEI unit is hand-built with mechanical advance weights that are manufactured in-house. The springs that control the rate of the centrifugal movement are selected and installed based on the advance curve needed for the engine modifications. Mechanics of that time would often fold the cover of a matchbook to use as a gauge to reset the gap in their breaker points. It was a common occurrence, and one of the first things savvy wrenches checked before looking for fuel issues in a car that wouldn’t start. Points would pit and burn so badly that no amount of filing of the contact area of the points would result in a surface that would hold a proper gap. They would have to be changed, and most car manufacturers recommended a scheduled replacement of these consumable breaker points. Even the sensing unit is greatly improved in the modern ignition systems. The reluctor wheel’s phasing helps the control module with ignition timing. When we saved our project truck from the crusher, it ran, but it didn’t run very well. The idle was not steady and the old engine stumbled a lot. The vacuum was low, very low, like 15 in/Hg low. The oil pressure would start out fine but within a few minutes of operation, the oil light would come on. This gave us the classic symptoms of worn engine bearings with too much oil clearance. The vacuum could be improved as high as 19 in/Hg with changes in the timing, but most of the time the vacuum hovered around 15 inches, and the oil pressure issue remained. Similar to most of the old stovebolt inline sixes, this engine was simply too stupid to die, so it just kept running. Seeing the old engine’s heart, we knew there was still a mule in there. All we needed to do was figure out how to wake up the combustion. Our first assessment was that the engine was unhealthy due to vacuum issues. Instantly we knew that the spark plugs and plug wires would need to be changed, and it would be prudent to replace the breaker points and condenser, but the archaic vacuum advance on the 50-plus-year-old dizzy was suspect. While we love the look of the copper tubing hard line, we realized it alone could cause enough vacuum leaks to make the engine run poor, so we decided to replace the tubing with hose. The goal of every ignition system designed for street use is to achieve the best efficiency and minimize wasted combustion energy. Knowing that, our very first question to Davis concerning why the Davis Unified Ignition (DUI) HEI would work on our project to achieve top efficiency was met with a very simple answer. “Everything is done by hand,” he said, “and we have a lot of experience here.” (BAM! That just happened). Davis started by giving us a lesson which could have been entitled “the science of combustion.” Reminding us that an engine at idle and highway cruising speeds operate on leaner mixtures, which take longer to burn during each combustion cycle. The distributor cap is notched so that it only fits on the distributor housing one way. Because lean mixtures require more burn time, ignition timing needs to be advanced to allow that time. “If you had a timing light on your car at highway speeds, you would be surprised at how much advanced timing is pulled into your ignition,” he said. Conversely, rich mixtures burn faster so the ignition can be started later (retarded ignition) to achieve the same level of maximum efficiency. How Does The Timing In An HEI Get Advanced? Keeping things at a basic level, spark timing is controlled by mechanical and vacuum advance systems built into the distributor. According to Davis, the centrifugal advance acts on the spark timing through engine RPM and doesn’t consider engine load or operating conditions. Davis explains that the amount of timing advance and the rate at which the advance takes place is determined by a system of weights and springs attached to a cam mechanism. The previous owner had installed a ballast resistor, normally mounted on the firewall, to the heater hose. These ballast resistors were often called “points savers” as they dropped voltage to prevent the arcing or transfer of material across the breaker points. We could get rid of this with the new ignition system which ups the voltage instead of reducing it. The timing added by the mechanical advance is also added to the initial static timing set into the ignition system. When the distributor is installed in the engine block and adjusted using a timing light to the timing marks on either the flywheel or harmonic balancer, the timing is total of the initial static timing and mechanical advance. This combined advanced timing is referred to as total timing. If you’ve ever noticed, all procedures requiring static timing to be set specify that the vacuum hose is disconnected from the distributor and plugged before setting the initial static timing. At this point, vacuum advance has nothing to do with total timing or static timing. As the name implies, vacuum advance works solely on a manifold vacuum and with the line capped, no vacuum is acting on the advance mechanism. We could also get rid of the external coil and coil wire. The HEI unit is equipped with a coil on top of the distributor cap. Davis and the crew at Performance Distributors calibrate each distributor they sell for the specific application. According to Davis, they take into consideration the octane level of the gasoline, camshaft and valve timing events, compression ratio, and weight of the vehicle to refine the art of combustion in the engine. Each distributor is calibrated according to the operation and needs of the engine that it is destined for. In the case of our project truck that will be running on the lowest grade pump gas, with a stock camshaft, stock spark plugs, with an upgraded set of Livewire spark plug wires, and vacuum and mechanical advance curves that are less aggressive than many other units. Once the engine has started and is idling, the vacuum advance begins adding spark advance at 7.5 in/Hg with a total of 14 degrees of timing at 13 in/Hg. Our static timing is near TDC with the old ball and pointer timing marks on the flywheel, which means our total timing advance at idle is close to 14 degrees. Remember that when the throttle is opened, manifold vacuum drops to near zero, which takes the vacuum advance out completely and timing advance is handled by the mechanical advance. Also keep in mind that when the accelerator pedal is pushed, the mixture is instantly enriched and faster burning, so it doesn’t need the additional spark advance. The throttle plate opens and the vacuum drops to zero, retarding the spark timing back to the static timing advance. In our case, the static timing is near 10 to 12 degrees until the mechanical advance comes into play. We made sure our static timing was set a zero with the ball and pointer timing system that was common with the 235 cubic-inch Chevy Blue Flame engines. Then we marked where the rotor was in relationship to the engine before removing the stock distributor. The mechanical advance curve is also calibrated by the Performance Distributor crew by changing the springs and centrifugal weights on the distributor’s mechanical advance cam. The vacuum advance does not come back into play until the throttle is closed and the manifold vacuum increases and the mixture becomes lean again. Performance Distributors manufactures its own centrifugal weights in-house, allowing for a tighter control of tolerances in manufacturing these distributors. Our distributor was set up with a pretty tame mechanical advance curve starting with 2 degrees at 1,100 rpm, 10 degrees at 1,800 rpm, 16 degrees at 2,400 rpm, and 22 degrees at 3,400 rpm. While the stock distributor appears much smaller than the new DUI HEI unit, the engine bay has less clutter with the HEI unit installed. Davis explained that a large part of the DUI distributor’s performance comes from the custom-calibrated advance curve. The weight and spring assembly are hand-fitted and fine-tuned using a Sun distributor machine which results in a precise timing curve for the specific engine and application. When it comes to your vacuum advance curve, the earlier the curve starts in the rpm range is when the system takes full advantage of fuel efficiency. “A smooth advance curve helps provide instantaneous throttle response,” said Davis. “It also helps with maximum power throughout the RPM range without any pre-detonation. The vacuum advance curve is tailored for improved fuel economy and cleaner spark plugs,” he added. Installing the new distributor requires that the oil pump slot is in the correct position to align the rotor in the same position as the rotor was pointing when the stock distributor was removed. With the new HEI distributor in place, make sure the distributor housing is firmly against the engine block and the distributor shaft still has up and down movement. Vacuum advance calibrations are different between stock engines and modified engines, especially engines that have gnarly camshaft swaps and relatively low manifold vacuum at idle. These type cams will produce a rough idle that stock-type distributors will dither in and out of advance in response to the changing manifold vacuum, creating an even more unstable idle. For the best engine efficiency and performance in a street-driven car, you need vacuum advance connected to full manifold vacuum. After the distributor has been checked to ensure that it is not bottomed out on the oil pump and the rotor is pointing in the correct direction, the distributor cap can be reinstalled. The Performance Distributor’s Chevrolet Street/Strip DUI Distributor (PN 62720BK) will run you just about a super-sized Big Mac meal under $400, but is the most dependable pushbutton fire-and-forget system you can buy. A stock rebuilt distributor will cost around $150, and a replacement aftermarket stock-style distributor will be around $200. Then you have to worry about the coil and ballast resistor. Keep in mind that the stock-style distributor will require monthly maintenance with points and condenser replacement at least annually, if not sooner. The worry-free, trouble-free, and maintenance-free DUI HEI will cost you just south of $400, but is well worth it for several reasons: It’s dependable, worry-free, and you can practically install the unit and forget about it. There’s no points to worry about and adjust every month. The DUI HEI cleans up the engine bay by putting everything you need into one unit. The coil fits right on top of the cap. There is no ballast resistor to mount. There is a single wire to hook up the distributor and a single wire to send a signal to the tachometer. The larger HEI cap still allows room on either side to remove the No. 3 and 4 spark plugs with a ratchet and socket without removing the distributor. We used a generous amount of the dielectric grease on the cap terminals and spark plug terminals to prevent the spark plug wire terminals for sticking to the plugs or distributor cap. A distributor swap is probably one of the easiest operations that can be carried out by mechanics with a little experience and hands-on ability. We started by removing the old stock distributor, the distributor cap, vacuum advance hose, and distributor hold down clamp. Before lifting the distributor out of the engine block, we marked the rotor position so we could place the new rotor in the same exact location. Then we lifted the old distributor out of the block. Installation of the new distributor was almost the reverse of the old distributor removal. We needed to check the position of the rotor and the relationship of the oil pump drive slot. Using a long screwdriver, we lined up the oil pump drive to accept the base of the distributor when the unit was inserted in the engine. Sliding the new distributor down into the engine, the rotor will need to be turned counter-clockwise a few degrees to allow for the gear engagement as the distributor gear turns against the camshaft distributor drive gear. We installed Performance Distributor’s LiveWire spark plug wires and billet aluminum plug wire looms to protect against the wires rubbing against each other. Ensure the rotor turns back to the position marked when the old distributor was removed, and make sure the oil pump drive is engaged. Like most Chevy engines of this era, the distributor can bottom out on the oil pump when installed. If the distributor has a slight bit of up and down movement while the housing is held down against the engine, the distributor is not bottomed out and will work fine. If it does bottom out, a shim set can be purchased at any car parts store. Installing new spark plugs and spark plug wires is essential in taking advantage of the distributor properties. Don’t cheat yourself by installing old components here. We chose to upgrade to a serious set of plug wires with Performance Distributor’s Livewire spark plug wires. Look for another article coming soon about this product. We changed the vacuum port on the carburetor to a standard hose barb, then connected a silicone vacuum line instead of the stock rigid hard line. Getting the plug wires installed correctly is fairly simple. 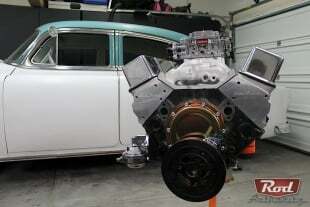 On the 235/261 cubic-inch Chevrolet straight-six engines, the cylinders are numbered from one to six from the front of the engine to the back. For the proper engine timing order for these straight-six stovebolts, the old timers used to say: “Think about women: 15 is too young, 36 is too old and 24 is just right.” This gives us the timing order of 1-5-3-6-2-4. You’ll probably never forget that again. We hit the timing marks with a timing light and adjusted the distributor for spot on timing. Davis reminded us that we should avoid digital timing lights, as they might affect the signal, giving an inaccurate timing flash. “This goes for all high voltage HEI distributors and not just Performance Products’ distributors,” Davis added. “Digital timing lights are ok for stock HEI units.” The digital type timing lights are often very sensitive and pick up signals that are not related to the specific cylinder being checked. To be safe, the typical inductive type timing light should be used. Our initial vacuum reading was a little disappointing, but after a quick check and adjustment of the engine timing, we were slightly over 22 in/Hg. It doesn't get much better than that. The completed assembly showed us how much room could be recovered in the engine bay, while improving the performance and reliability of the engine. Now we just need to get the rest of the engine steam cleaned. Our vintage engine started easier, ran smoother and cleaner than it has since we’ve owned it. It probably runs better now than it did when it rolled off the assembly line. All in all, the distributor swap solved a lot of issues we had with the old stovebolt. We found another odd benefit with the distributor change: our project truck had an oil pressure problem that presented itself as worn engine bearings. The pressure would begin high and a short time later the oil pressure light would come on. This is the classic symptom of worn engine bearings. After changing the distributor, our oil pressure has remained constant and good. The old distributor was not bottomed out and both the gear drive and oil pump drives were good. Neither Davis or anyone here could explain the improvement in oil pressure … but we will take it!